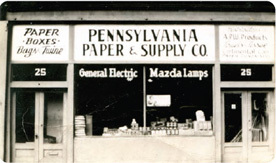 In 1922, 23 year old entrepreneur Jacob Fink, born into a family of entrepreneurs, saw a business need in Scranton, PA: the many mom and pop grocery stores on nearly every corner needed paper bags for their products, so he created a company and started looking for clients. Deliveries were made by truck, and even by the occasional horse and wagon. As he started to get to know his clients' needs, one product became two, two became four, and before long, the company was on its way. Over the ensuing years, as the company grew, he bought a building at 25 Lackawanna Avenue which consisted of a small warehouse and showroom, with offices on a second floor. The fledgling company was strong enough by the 1930's to survive the Great Depression, and when things became very difficult, warehouse day workers unloading boxcars were paid with a dollar and a shot of whiskey. Continuing this tradition, Jerry Fink joined the company's ranks in 1946 at the age of 19, shortly after his discharge from the army. After spending a few years learning the ins and outs of each department, during the 1950's and 1960's he began to add cleaning supplies, equipment, and equipment repair services to the company's product line. This was at a time when the best technology had to offer was bleach, ammonia, carnauba wax, and a brand new electrical device known as a "Hoover." This period was one of steady growth, despite the fact that the economy in Northeast Pennsylvania began to experience sweeping changes as the coal mines were depleted and closed. The business saw so much expansion, that in 1967, a 100,000 square foot building at 215 Vine St. in Scranton, PA was purchased, and the company relocated there in 1970. This still serves today as the company headquarters. In the 1970's, the economy and country continued rapid and dramatic change. The corner grocery stores began to give way to supermarkets; multiple gasoline and economic crises had taken hold and put great stress on the operations of many companies. In 1972, a competitor named Megargee Brothers went out of business and Pennsylvania Paper and Supply was well positioned to absorb the vacuum left in the marketplace. More people were hired, product lines were added, and the steady growth continued. In 1978, the same year Jacob Fink passed away, a furniture maker in the adjacent building named Stacor Corporation needed to downsize, and their building was purchased. This added another 125,000 square feet, so offices and a showroom area were built. It also resulted in a surplus of space, and this presented the opportunity to enter the warehousing and storage industry, which eventually morphed into an affiliate company named FlexStore that survives to this day. The early 1980's brought the company's first experience with computer technology, as we had relied on #2 pencils exclusively to this point. A room full of equipment was installed that had much less electronic storage capacity than a typical cell phone does today, and it was nearly impossible to get through a day without the system crashing. Despite this initial high expense for limited benefit, the company pressed on and stayed in the front of the wave of technology sweeping the business world, with the help of Douglas Fink, who joined the company in 1985. Numerous and ongoing investments in information technology were made, and these developments ultimately had the company utilizing the best in state of the art distribution and financial management software. In the early 1990's, two longtime competitors, D&L Supply and Paper Sales Company, saw their owners about to retire, and the company completed an acquisition of both at the end of 1993, the same year Douglas Fink succeeded Jerry as President. This nearly doubled the company's volume, and solidified its leadership position in the marketplace which continues today. The dawn of the 21st century brought many more challenges and opportunities, which the management team responded to by adding services to the line of products that by now numbered in the tens of thousands. Sovereign Commercial Services was born in 2003, and very quickly became the standard to which all other facilities services companies are held up to, while at the same time growing in just a few short years into the largest and best commercial cleaning company in Northeastern Pennsylvania. In addition to providing services, the company filled a strong educational need by building the Facility Management Resource Center in 2006. This allowed the company's Certified Consultants to train our clients' staff in the proper products, procedures, safety, and legal compliance issues which have made the janitorial/sanitary supply industry so complex today. It also is outfitted with an equipment training area, to instruct users correctly and keep them up to date with the latest industry innovations. These classes are also conducted on site at our customers' locations in many circumstances. 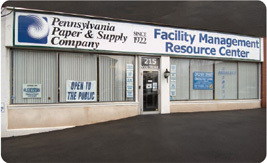 2008 brought the first edition of our comprehensive Facility Management Resource Book, the best place to locate information and products for just about everything you need to operate a building. This data was mirrored on the company's new website which also expanded our reach to the national marketplace, and allowed for the first time the ability to attract and serve clients from across North America. In retrospect, even though the company has grown larger and more diversified through the years, we retain and increase our market position by keeping in touch with and maintaining an intimate understanding of the needs of our clients, who in many cases become our friends.